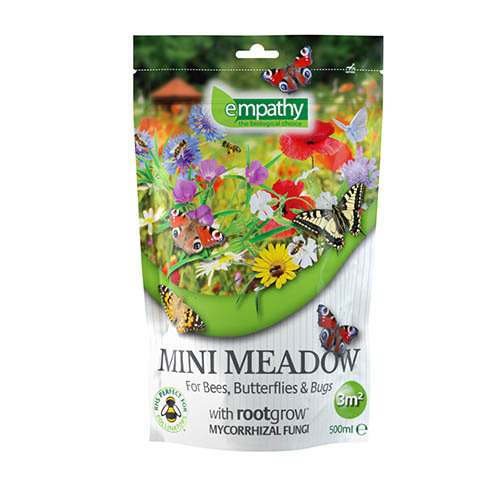 Empathy Mini Meadow with rootgrow is the ideal way to achieve perfect habitat for pollinating insects. Suitable for all size gardens All you require is a 10sq.m2 patch of garden and you can have your own Mini Meadow. Seeds included are: Yarrow, Corn Cockle, Cornflower, Common Knapweed, Foxglove, Viper’s Bugloss, Lady’s Bedstraw, Corn Marigold, Oxeye Daisey, Field Forget-me-not, Common Poppy, Selfheal, Meadow Buttercup, Red Campion, White Campion, Salad Burnet, Great Mullein.